The Kansas Authors Club is hosting the state convention for October. I’m chair of the convention committee, and that as taken up almost every moment of my life. However, I had time to read Ursula Le Guinn’s collected blog posts, a fascinating look into the mind of one of the greatest writers of our time. Le Guinn died not too long ago, but her blog posts have brought her alive on the page. She roamed from traveling with her husband to dealing with a strange cat. I couldn’t put the book down. Because of her sections on Pard, the cat who never wanted to go outside, my thoughts turned to our dog. She is in a long line of dogs we’ve had over the years. At one time, we had five dogs, most of them being rescued from the street. One poor dog, a part chow was left behind outside in winter when the family moved. She was so frightened when I got her home she hid between the refrigerator and the stove. We finally coaxed her out with food. Our collie Mulan was given away by a family who probably used for breeding. She tried to run away when we got her home and my husband had to run after her and bring her back. Soon, though, she joined the group on the back porch where all the dogs slept. We had decided she would our last dog. By then, all our other dogs had died, a sad thing every time. Well, life had other plans. About five years ago, I was driving home on the Kansas Turnpike when I saw a truck in the left lane swerve. When it went on down the road, I saw this tiny dog standing by the media. There wasn’t any traffic right then and I was calculating my changes of getting across the road without getting creamed. I pulled over and turned on the flashing lights. Then I got out of the car, took a big breath, and wondered what the heck I was doing. The I saw this little thing behind the car. I knelt and the dog ran into my arms. She laid on my coat in the passenger seat all the way home, keeping her eyes on me the whole time. We knew we had no way to find the owner. We took her to our vet who told us she looked like a designer dog, part Yorkie and part poodle. She was in good health, maybe around three years old. She had a black coat with golden legs and a curly tail. She shyly looked around the house, then when we went to bed, she jumped on the end of the bed. That’s where she’s slept every night since. My husband became her best friend, taking her for walks in parks all over the city. She also became friends with Mulan. Every morning as Annie, yes, we settled on that instead of Little Orphan Annie, was ready to go out in the back yard, my husband would say, “Go get Mulan.” Annie would run into the living room where Mulan slept in front of the fireplace, bark, and Mulan would get off and follow Annie outside. Mulan became so ill we finally had to put her down. The first day Mulan was gone, Annie had a puzzled look on her face. She has adjusted, of course. She’s smart, fun, demanding when walk time rolls around. She loves people and everywhere she goes, she wags her tail and does a little dance if someone gives her a pet. She chases squirrel in the park. The squirrels have learned to tease her before they run up a tree. She’s brought joy to our lives. When she gets through running, she snuggles up next to me on the couch. What a gift she is, our Turnpike traveler. The Saturday before Christmas, our neighbors came over for our annual gift exchange. We had a pleasant conversation and glass of wine, then they went home. I went into the bathroom and fell. I had no idea how I ended up on the floor. My husband heard me fall and came in to help me get up. I then moved to the couch where I tried to talk about what was going on, but what came out was “word salad.” My husband called 911 immediately and the ambulance showed up quickly. My husband said an EMT gave me a shot that eased the effect of the stroke and I was able to talk normally again. Two EMTs sat with me and asked questions, such as what my name was, when was I born, where did I live, etc. I was able to answer everything correctly. When we got to the hospital, I was moved to a gurney and doctors I’d never seen before went into fast action. Soon, I was in la la land as the doctor, or doctors, used the procedures necessary to crush the clot that had invaded my brain. I’d been treated for years for afib, which basically means I have an irregular heartbeat. My cardiologist said the drug I was taking wasn’t strong enough and he prescribed a new one. After I got out of the hospital and went to see him, he also prescribed a ton of new drugs. My husband got a new pill box—a big one—and helped me sort it all out. I’ve never had to take a lot of drugs, so this is new territory for me. I’ve also discovered that the little glass of wine I drink with dinner now makes me drunk. My last vice, unless you count coffee, gone by the wayside. The biggest problem since I’ve been home has been fatigue. Well, my right hand still doesn’t function very well, making typing a chore. However, I’ve written several poems since I got home, and I consider that a victory. Now if all those drugs keep working, I could live forever. I do have to live for a at least six months because another publisher wants to publish a book of my poetry. Did I say I had a book out, The Sad Joy of Leaving? I’ve sold quite a few and hope to sell more. Two hundred copies of my book of poems, The Sad Joy of Leaving, arrived the second week of October, too late to sell at the Kansas Authors Club convention. Even so, I sold one book there based on a picture of the front cover I took with me and put up in the book room. After the books came, sales took off. I was surprised, but happy. Many of my Facebook friends bought one from me or from the Blue Cedar Press web site (http://bluecedarpress.com/product/the-sad-joy-of-leaving/). Some of my Wichita friends shelled out $15 to pay for the book. I got positive feedback from a few readers, who said they identified with certain poems or thought the book spoke to them. Mike Poage, the publisher and one of the editors, said we needed to do a book launch. He suggested I read along with him and Kelly Johnston. All three of us had been published by Blue Cedar Press We discussed where to hold the book launch and readings and decided to approach Watermark Books and Café (https://www.watermarkbooks.com/). Around thirty people came, most of them writer and poet friends. We had a great time, and as is the practice at Watermark, we went to the basement to sign the wall. Our names are there with such luminaries as James Lee Burke and Katha Pollitt. It was a perfect evening. I wore a tiara—don’t ask. Well, yes, ask. After Mike, in the e-mail exchanges before the launch, told me I was the most important person, etc., etc., I said I felt like a queen and I should wear a tiara. He and Kelly thought that was a great idea. I happened to be in the grocery store right after Halloween and the clerk found a tiara, complete with fake pink gem, for me to wear. .
People laughed in the right places and became somber when I read my poem, “The Yellow Dress,” a poem about domestic violence. During the time between getting the boxes of books and having the launch and reading, I was busy selling the book and keeping track of sales. I also set up plans with Watermark and had to get ready for our big night. Nothing much mattered during that time. Now life has returned to normal. I’m still selling books, but I think I’ve sold enough to start earning royalties. We’ll see when I have time to add up everything. In the meantime, I also got a poem published on the Ekphrastic Review web site. I may try to get more poems published there if I get a moment to do that. Now I have to get ready for another publishing venture—or adventure, if you will. Another publisher, one who has seen my work online, wants to publish a manuscript of mine. I have until May 1, 2019, to pull something together. We’ll see how that goes. I already have an idea for the book and a picture for the front. My friend Sandra Loux will once again do the picture as she did for The Sad Joy of Leaving. So, here I go again. It’s pretty exciting to be doing this at my age, as it would be at any age. Off to the races! I go to water aerobics at the Y three days a week. It’s a good workout, and I enjoy talking to the friends I’ve made over the years I’ve been hopping around in the water. Our instructor plays a mixed tape of music from the ‘60s and ‘70s, music that most of us in the class remember from our younger days. One of the songs, “Na Na Na Na Hey Hey-ey Goodbye,” sung by a group I never heard of, intrigues me with me with its repetitive lines, especially the repetition of the word, “good-bye.” The song gets under my skin in a way none of the other songs do. One day, after an hour in the water, I went into the locker room and grabbed a paper towel from the dispenser. I found the pen that I keep in my swimming bag and started writing lines on the paper towel. The lines turned into a poem, “The Sad Joy of Leaving,” which you may read below. might have been but never was. a dance routine never altered. I’ve had many experiences of leaving, starting with going to college in a city three hours drive away from the small town and the home I’d lived in most of my life. My first year of college was mostly successful. I worked in the college library and I made As and Bs in most of my classes. However, I wasn’t as diligent as a college student as I had been as a high school student, and by the end of the second semester, I was sick of school. I married a student I had met while I was working at the check-out desk in the college library. During the thirteen years we were married, we moved sixteen times, most of those moves from city to city as he got better jobs. I also managed to complete my BA during this time. Then the day came when I knew I had to take our kids and move back to Kansas. We stayed with my parents until I was able to get a teaching assistantship and start work on a master’s degree. Off we went to a new town. I met another man and fell in love, even though I said I would never fall in love again. We got married and moved to the town where I had a high school teaching job in Winfield, Kansas. After a couple of years, I came home one day to find my husband gone. I had no idea where he’d gone, but I assumed it was back to the west coast where his family lived. My kids needed a place to call home, so I decided to stay where we were until my kids got out of high school. By the time the youngest son went off to college, I was ready for a change, so I quit my high school teaching job and got into the creative writing program at Wichita State University. I was married again, my husband had a job in Wichita, so we moved from Winfield. I left many friends behind with that move. I missed them, but I was able to get together with them off and on. When Blue Cedar Press accepted my manuscript for publication, I had one title on it, a title taken from of the poems in the book. One of the Blue Cedar editors who had read the manuscript suggested during an editorial meeting that we change the title to “The Sad Joy of Leaving.” She said this fit the book, as so many of the poems were about leaving. I saw immediately that this title fit the book much better than my title did, so I enthusiastically agreed with her. This title brought resonance to the book that hadn’t been there before. I still smile when I hear that strange song with the repetition of good-bye in it when I go to water aerobics. I often sing along under my breath. I do believe that poets have to take poetry where they find it. That’s true for me, anyway. It always helps to have a pen and a paper towel handy, as well. I suppose it also helps to have had many experiences in life, some good, some not so much. Those experiences give a treasure trove of resources to draw on for poetry. One day last fall, I was at a neighbors’ house to drop off something. The neighbors, husband and wife Mike Poage and Gretchen Eick, started Blue Cedar Press a few years ago. As I was leaving, Mike said, “Send us a manuscript.” I did, even though it took awhile to get one pulled together again. I had sent two manuscripts to two local presses with high hopes, which were dashed by rejection. This even though the few friends who read them thought they were publishable. I’m not sure when I sent the manuscript to Mike and Gretchen, but it was sometime around the end of 2017. In the meantime, Gretchen and Mike went to Bosnia and the manuscript hung in limbo. I did get occasional e-mails from Mike, Gretchen, and their editor, Laura Tillem, telling tme how much they liked the poetry. However, this was no guarantee that they would publish the manuscript. In the meantime, I was laid up after surgery. Gretchen, now home from Bosnia, came by for visits to see how I was doing. Then one magic day, she came by to tell me they were publishing my book. We set up a time for an editorial meeting, a late Saturday afternoon. I went down the block to Gretchen and Mike’s house, where Gretchen, Mike, Laura, and I sat around the dining room table, copies of the manuscript in front of us. I had given the book a title from one of my poems. As we discussed the title, Laura came up with an amazing idea for a much better title. She took the title of another poem, “The Sad Joy of Leaving,” and suggested it as the title. I immediately agreed, as that title fit the theme of the manuscript much better. From there, we continued to talk about other aspects of the manuscripts, with ideas and suggestions flying. We talked about cover art and I said I had the perfect photo, one taken by my friend Sandra Loux for our Broadside project. 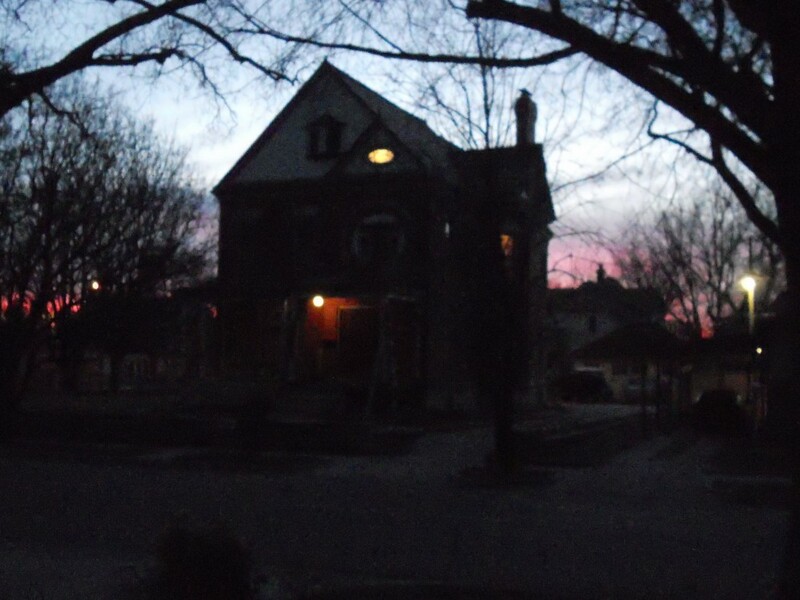 When I got home, I sent a copy of the photo, one of an isolated house at dusk, to the three editors and everyone liked it. I got Sandy’s permission to use, giving her credit, of course, and we were set. I also sent them some portrait photos of me to choose from for the author photos. They chose one taken by Kansas Writers Association member Rae Cuda. She took pictures of all the members one day to use as author photos. My photo was really good, and I was pleased it was chosen. We continued the editing process by e-mail, then when it was finally perfect—or at least as close to perfect as it could be—the manuscript was sent off to the format person in California. The book will come out in the fall. It’s been an exciting experience and I’m grateful for it. Even more exciting is that just after this book was sent off, another editor contacted me through Facebook. He said he wanted to publish a book of my poetry next year. He had seen my work on the Facebook page 365 Poems in 365 Days, a page developed by James Benger. So I will start work on another manuscript and will happily undergo another editing process. I’ve waited decades for this to happen. After spending time and energy preparing manuscripts and sending them off only to have them rejected, now feel justified–and overjoyed. I have left this blog to its own devices for a couple of months because of the knee replacement surgery I blogged about earlier. The weekend before the surgery, I almost called to cancel, as my knee was giving me little pain. However, plans were made, and I knew it would cause havoc if I backed out. This isn’t my first rodeo, as they say, with surgery. I’ve had several since my first, a tonsillectomy when I was 17. If I remember, my pain then was alleviated by great doses of ice cream. I’ve also given birth three times, each time becoming easier. Since then, thanks to effective pain medication, I have never suffered a great deal of pain after surgery. The knee replacement surgery was different. In the hospital, I must have been given pain medicine among the drugs the nurses dispensed to me on a regular basis. I got wonderful care during the three days I was there. I was in a small specialty hospital and the nurses were friendly, caring, and always there when I needed them, a welcome contrast to my last stay in a large hospital. I came home with a bottle of pain pills and instructions to take Tylenol if I didn’t want to take the pain pills. I had already thrown up once after taking the narcotic for several days. I did have prescription for an anti-nausea drug, but I was determined not to take the opioid I was sent home with. The first night in my own bed, however, turned into a nightmare. I took two Tylenol. My husband, awakened by my moaning, suggested I move onto the living room couch. He came and stretched out on the other couch and stayed with me all night. I did finally drop off to sleep. The next day, he took the prescription for the anti-nausea medicine to our pharmacy. After that, I felt no pain. The drug, while it eased the pain, also made me very tired. I took it for less than a week, then went back to taking Tylenol when I felt a twinge. Everything was fine. I was going to PT, doing the exercises at home on the days I didn’t go to the rehab clinic, I was recovering quickly. Then something happened I was totally unprepared for. I was sitting on the couch reading the news about the suicide of local woman whose young stepson had been found dead. There was another article about a famous chef’s suicide in the same issue of the paper. Suddenly, I went into a dark depression the likes of which I hadn’t experienced in decades. This frightened me so much that I called my doctor and made an appointment to see her. I wrote the date and time down on a piece of paper and told my husband, who would have to drive me to the doctor’s office. The day of the appointment, I got the time wrong. The receptionist then slotted me in for an appointment later that day. However, my husband and I decided to make an appointment for two days later in the morning. Unbeknownst to me, my doctor, not knowing I had changed my appointment, was worried that I had done something drastic. When I saw her, I assured her I wasn’t suicidal. I never have been, even in my darkest days. My thinking was, and still is, I don’t want to miss the wonderful thing that might happen tomorrow if I off myself. Besides, I’m a coward. And, above all, I have a wonderful family whom I love, and I wouldn’t do such an awful thing to them. My doctor gave me a prescription for Zoloft, an anti-depressant. I took one dose and knew I didn’t want to take any more. I told myself I could make myself happy again. And I did. The worst outcome of the surgery was my inability to write a poem. My brain seemed to go on vacation. I also forgot things. My brother and his wife came by with a sweet card and chocolates, which I devoured. When I saw them a few weeks later, my brother asked me if I remembered them coming by. For a little while, the memory of their visit completely eluded me. Bit by bit, the memory came back, mainly because they mentioned the sack of chocolates. A poet friend suggested I write poems about the surgery. I told her no one really needed to read a poem about pain. I could write a poem about my husband, who was so good to me the whole time I was recovering, or about my youngest son, who came to visit me from out of town to make sure I was okay. I could write about the weekend I spent with other members of my family. I have decided, though, to write as I always do. Whatever comes to my mind is what I will write. In the meantime. I got word that Blue Cedar Press has accepted my poetry manuscript, The Sad Joy of Leaving, for publication. The editing process for the manuscript has taken a lot of time, but it’s been worth it. The book will come out in the fall. Stayed tuned for more news. Three and a half weeks ago, I had knee replacement surgery. Since then I’ve dealt with pain or being out of it because of the drug I take to ease the pain. Many writers don’t let physical problems interfere with their work. Flannery O’Connor wrote from her bed when she was too ill from lupus to sit at a desk to write. Stephen Hawking didn’t let debilitating ALS stop him from writing books dealing with astrophysics. Emily Dickinson, who didn’t show outward signs of illness, became a recluse, sending her poetry sailing through the air from her second story bedroom window. I suppose if my pain continued I would eventually overcome it to get back to writing poetry. Right now, though, I’m in a state of suspended animation. It seems like an eternity since I went walking in the park with my husband and our little dog. Our front and back yards are putting on their spring extravaganza with everything blooming everywhere. Yet, I’m stuck in the house with only a view through the windows to taunt me. My dreary outlook blocks the pleasure I get from being out in nature, even if it’s just the nature in the park. I did manage to write two poems and I’ve started another one today. It’s not enough to satisfy me, but it’s a start. I have a folder of drafts of poems that I never got around to polishing. Some of them are at least thirty-five years old, but they still show promise. In the meantime, I’ll keep trying to write something, either by revising an old poem or writing about what I can see from the window.